One thing I have found often and more so just now is finding those friends who really understand what life is like. I have a great circle of friends but there are only very few who really appreciate how I have to live my life and the accommodations I need to make. I have found since my breathing has got worse and everyday life needs to be planned out it becomes harder to fit in and be able to do everything that I may have been able to do a few years ago without a second thought. I hate to think that I leave friends in the lurch but I know often I don’t commit to plans because I am worried that I will say yes and then have to pull out of something. It is just easier to not commit or turn something down to avoid the disappointment to me but also the inconvenience to others it causes if I cancel- and there is that bugging thought I have that they will just stop asking me to things as either I say yes and don’t go or just say no. There are those few people in my life who really get what life is like and can understand how difficult it can be. One really good friend who I met at an event with Astra Zeneca just gets me and gets life. He understands, he has had asthma control his life too and desperately tries to do what he can when he can and doesn’t stop trying. When you have someone who you don’t have to ask to walk a bit slower because they can tell by the sound of your breathing that you need to slow, they don’t look at you as though your head is about to fall off for taking medication in public and someone who you can say what you really feel to. I have been so lucky to meet Anthony and since we first met conversation has come so easy and there is never that awkward silence. When I first met him I had not long come out of intensive care and had pushed myself to go to London to speak at an Astra Zeneca event. He said as soon as he saw me he knew I wasn’t well and could tell by the way I was and the way I held myself. I guess us asthmatics do have a way about how we sit, and talk as I can tell with others if they are having a tough time with their breathing. He was so good to me and not in a pitying way but because he knew just what it was like. We have shared our challenges of living with uncontrolled asthma which stops us doing a lot of what we would like to and many of the frustrations which we both find everyday. I really do cherish friends like Anthony because asthma can be so isolating and until you have had the struggle of not being able to breathe you really don’t know what it is like and can never know. We can give you an idea for example breathing through a straw, with your nose pegged and running up stairs but with this when it gets too much you can take the straw out, nose peg off and take in big gulps of air. With asthma you cant do this, you just have to ride through it and hope the medication works soon before you get too tired. Anthony is one person who I can really say if things are really rubbish, and that it is all too much, or that having asthma like this scares me, it really does and I hate that there are others who have it like that too but then I also don’t feel alone in feeling scared of asthma. Being able to work together on projects with AUKCAR and SPEAK Asthma has been great as we both love working with children and people. When it was suggested that Anthony might want to come up to one of the SPEAK Asthma groups I couldn’t wait. 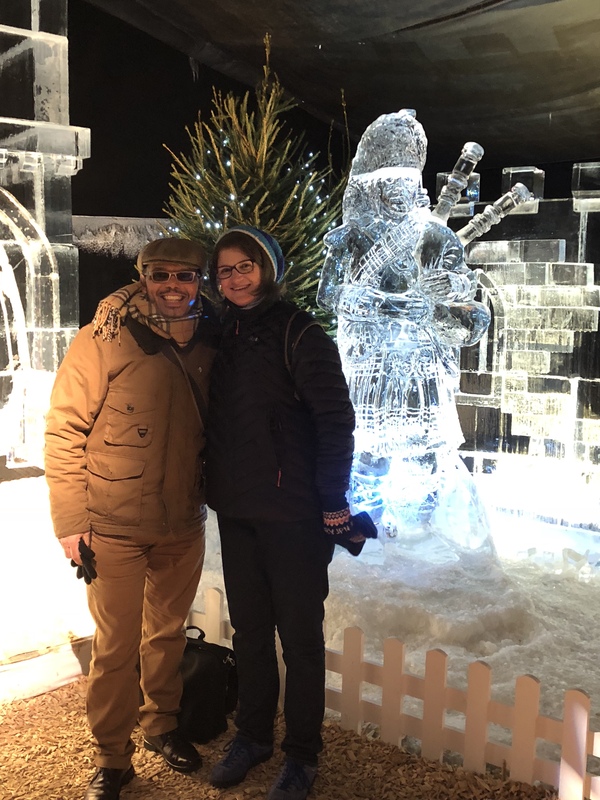 We were able to spend time wandering around and seeing the Ice Sculptures at Edinburgh’s Christmas and then go to the meeting with the children and young people. It had been a bit of a touch week but this just ended it all on a high and made things all ok. 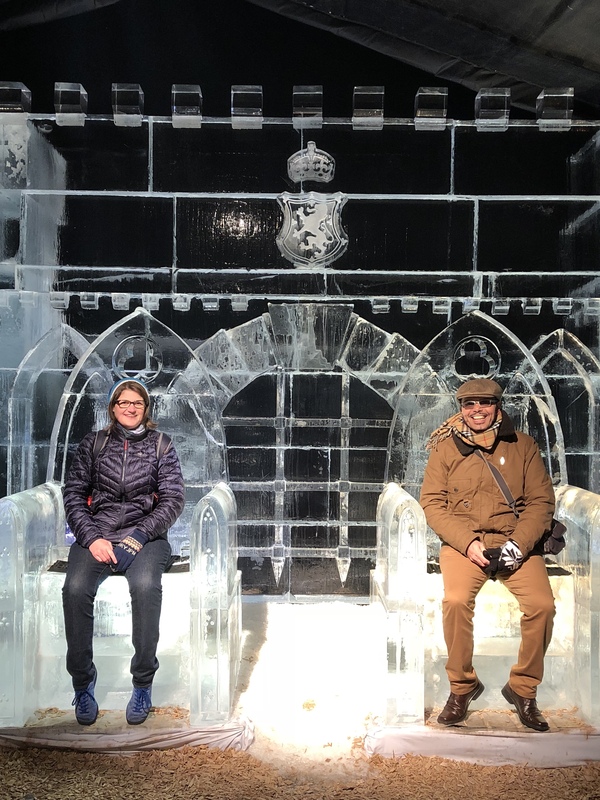 I am looking forward to January and the Annual Scientific Meeting in Bristol where we can catch up again and arrange many more trips. OMG this is so true. I do not have asthma but, I do have fibromyalgia. Thankfully my fiancé is amazing as well as some close friends.